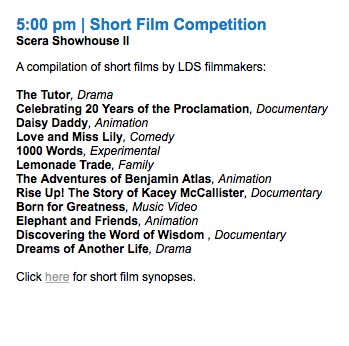 This coming weekend, March 5, 2016 at 5pm, 1000 Words will be screening and competing against other short films at the LDS Film Festival. It is an exciting moment for 1000 Words because of the impact it can make on an auditorium full of spectators. They don’t know what they are in for. 1000 Words isn’t what most people will be expecting in such a setting. It even fits under the genre: Experimental. An experiment in deed! When we set out to make this film we didn’t know if it would even work… but it did. You can see the list of other films that will be showing during the Short Film Competition, my favorite part of the festival. Come watch all of them and vote for your favorite! Since launch 1000 Words, more than 3000 people have taken a 15 minute respite from the chaos of busy living to tune-out the noise and tune-in to the soul. You wouldn’t think a 15 minute silent film, at normal speed, would captivate anyone, but it does. And more than that, without a single spoken word, the film speak louder than any other interview on self-worth that I have ever seen. It tells the stories of a range of women. From ages 4-92 we get the full breadth of emotions felt by women and girls every day. The commentary after watching the film is always the same: at the end of the spectrums there is a confidence that is lost in the middle. But that isn’t the only thing the film exhibits, to see what else, you will just have to watch it for yourself. Come see it and support it at the LDS Film Festival and then find me and tell me what the film spoke to you!